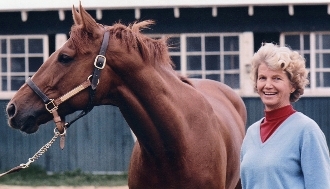 This newly re-edited version of “Penny & Red” paints an intimate portrait of Penny Chenery, the owner of the champion thoroughbred Secretariat. The film explores Penny’s early struggles as a daughter, mother and housewife, her emergence as an owner and celebrity, and her redemptive role as spokesperson for a great equine athlete. Special features on the Blu-ray include HD remastered full versions of the Triple-Crown races, a classic archival interview between Penny and sports legend Woody Broun, and rare footage of the Marlboro Cup.